On of the interesting features in windows vista is Windows Flip. The Windows vista flip make the windows vista desktop look like 3 dimension. If you use windows Xp you can add this windows flip features in your windows XP desktop. With WinFlip software you do it easily. WinFlip is free software and it portable so to use this software you needn’t to install the application in your windows XP. 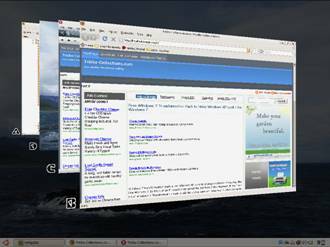 WinFlip is emulator software to add Windows Vista’s “Flip 3D” effect on windows XP. You can view the following picture to view the result WinFlip software in windows windows XP. Download the WinFlip software and extract it. Go to extracted folder and double-click on WinFlip.exe to run the software. After run the application, the WinFlip should appear in the systray. Use combination “Win + Tab” button in the keyboard to activate windows flip features. And the result like the picture above. If you need more option you can right clicking the WinFlip icon in the system tray the select “Options”. Related to "Adding Windows Vista Flip to Windows XP with WinFlip"